I was digging for something in my storage closet the other day and came across a bag of paper fans that I used for my daughter's fifth grade graduation decorations. 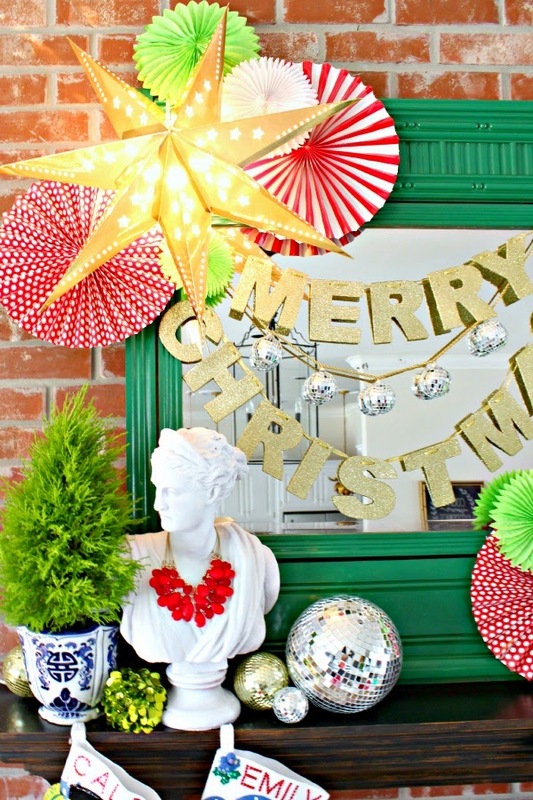 As soon as I saw them, inspiration struck for my Christmas decor this year! After using black, white, and metallics last year, I knew that I wanted to add red back in this year. So, this year's theme morphed into very traditional red and green, with a little bit of gold and blue and white thrown in, and a whimsical twist. 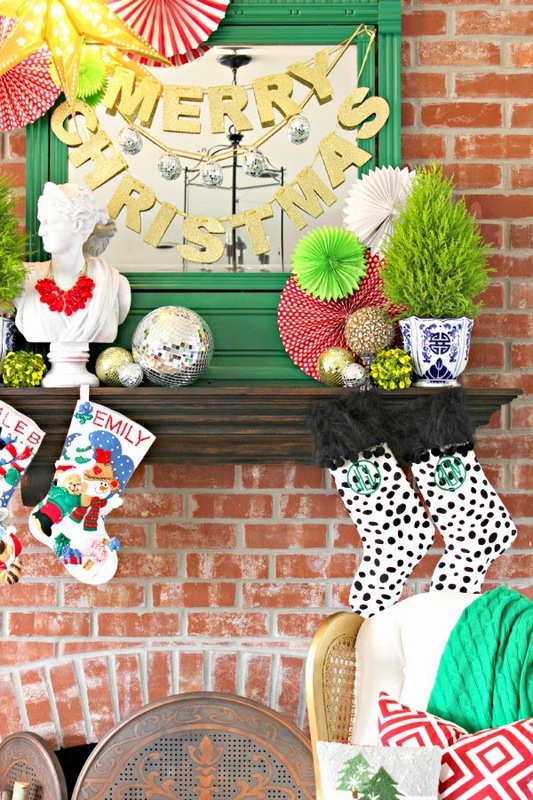 I've been hanging on to the Merry Christmas banner for a month or two since I first saw it at Hobby Lobby, and it ended up being the perfect focal point layered over the old dresser mirror that I used for my Fall Mantle a few years ago. The lighted star was a bargain after Christmas last year from Ikea. I picked up 3 for a few dollars each, not realizing how cool they were! Wish I had bought more. I shared my trick for using electricity for things on the mantle here. 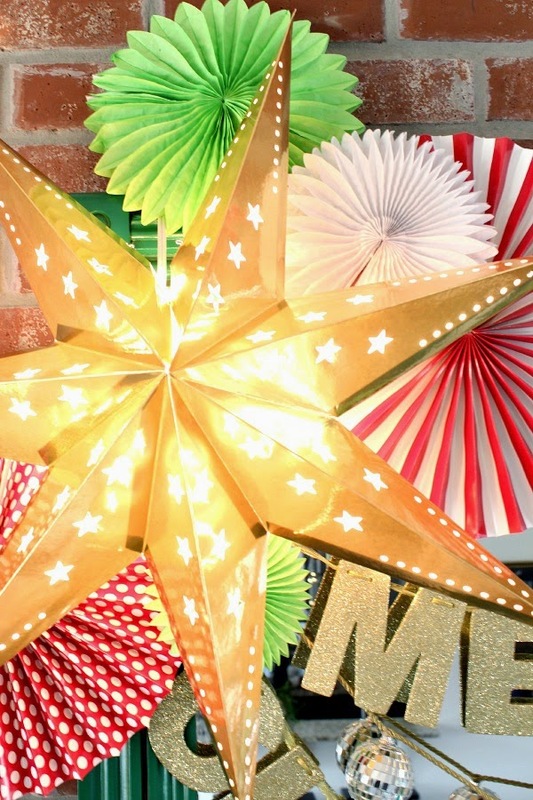 The paper fans were from Hobby Lobby and Party Galaxy. The patterned ones were in the party department at HL, but as I was checking out I think I saw some in the Christmas section as well. I bought 2 lemon cypress trees - one from Lowe's and one from Whole Foods - and planned to use them flanking my kitchen sink, but they were too tall. So, the mantle was the next logical place and I love the life and pop of bright green that they add. Scattered ornaments and mirrored balls finished it off and filled in some blank spaces. The mantle is the one and only thing finished around here, so I'd better get back to work! Are you finished with your decorating? 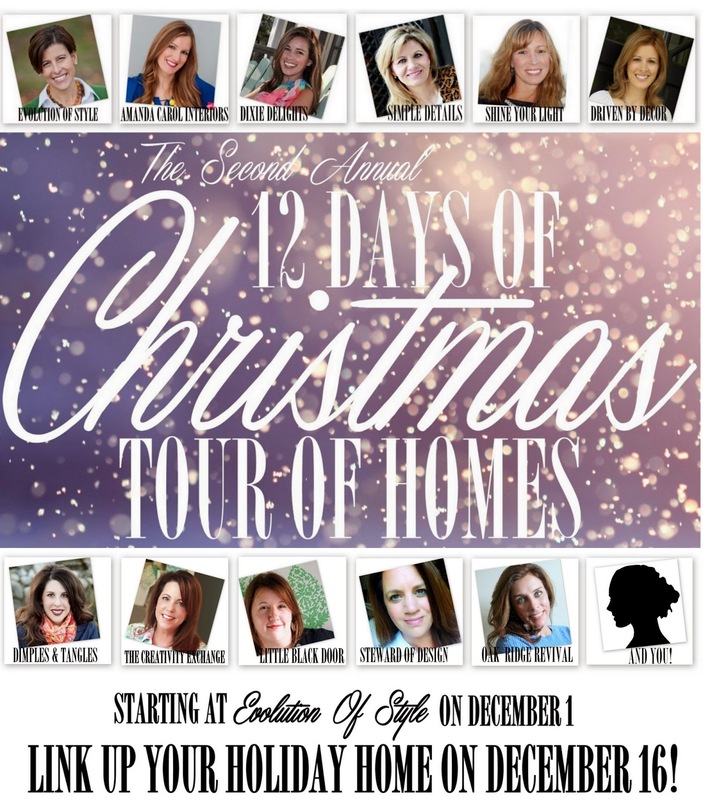 Have you been following along with the 12 Days of Christmas Home Tours this week? 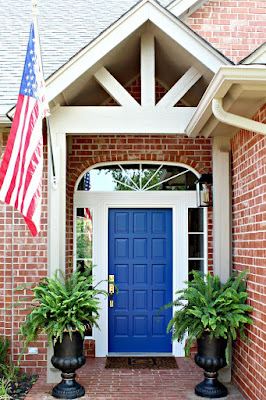 There have been 4 amazing homes so far, with a new on every day. 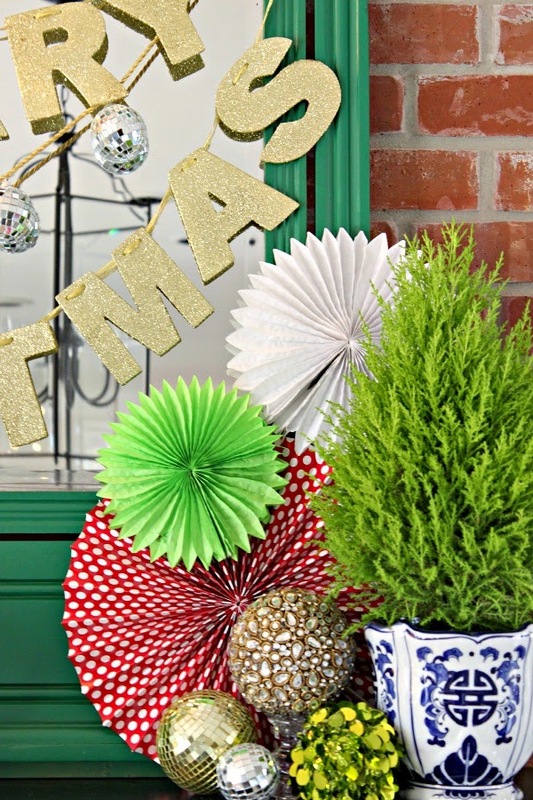 Don't forget, you can link up your own Christmas home on December 16! Here are the tours so far... you won't be disappointed! LOVE it! 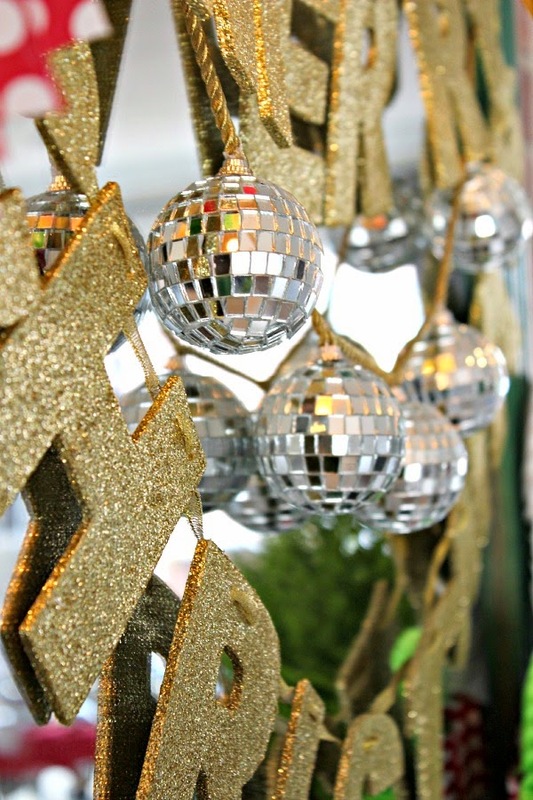 and i was thinking the other day how i would love to make a disco ball garland!! i need more disco balls in my life and more garlands because they make me so happy. So fun Jennifer!!! 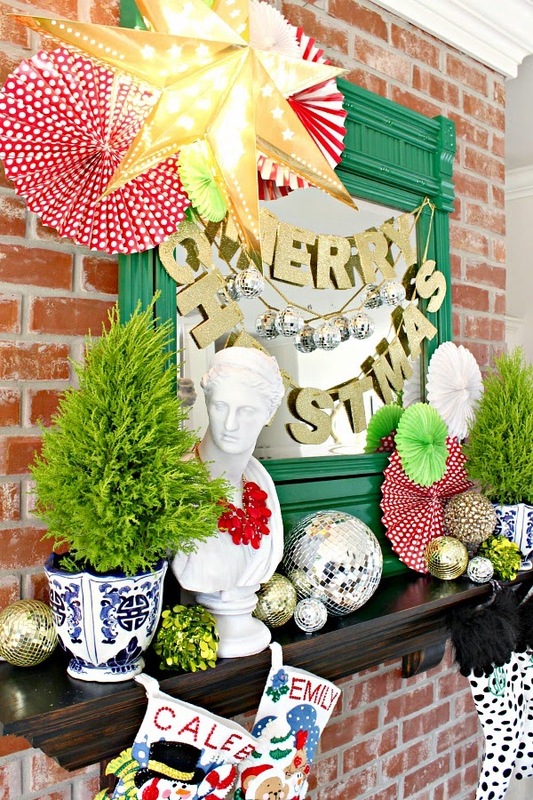 Love the green mirror as a base and all the colorful and sparkly elements. Definitely full of joy!! Thank you Lisa, it makes me happy every time I look that way. How fun is this (and so 100% Jennifer)! Can't wait to see the rest of your house too! 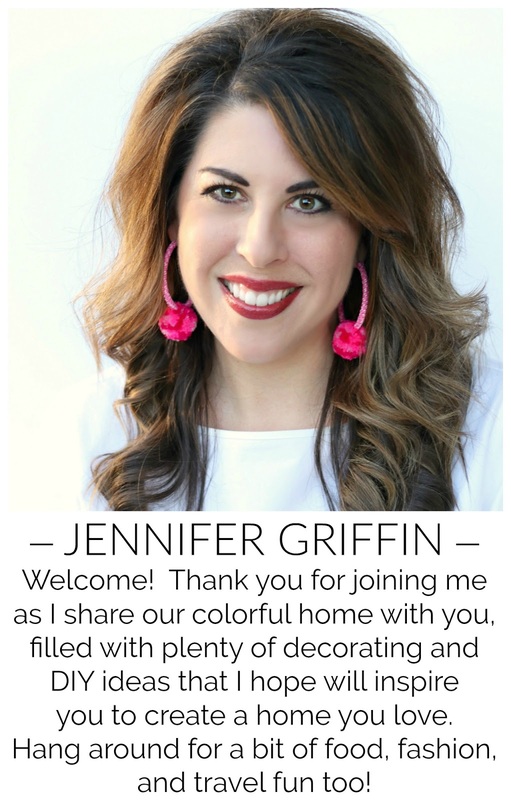 Looks great, Jennifer! I love that you used those paper fans to decorate your mantle. Somehow I feel if I tried that, it wouldn't turn out as great. Haha! Sun fun and festive Jennifer! I love that it is whimsical and still a little sophisticated. Perfectly you! Oh I love it, how fun and the fans add just a great splash of color and whimsy. Can't wait to see more. 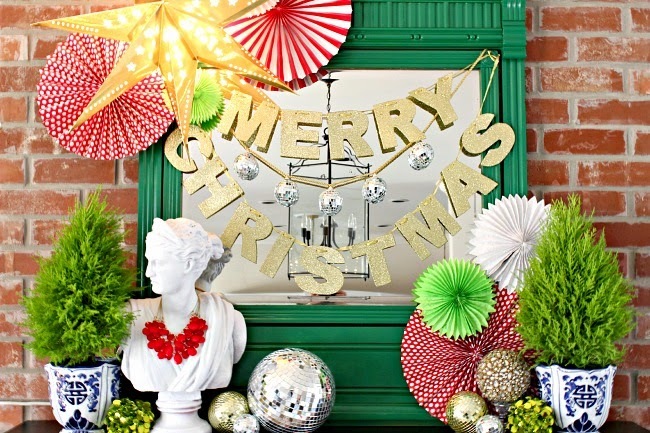 Love the cheery colors and the splash they make for Christmas! Love it! Love the mirror! Everything looks so festive. so fun and festive! 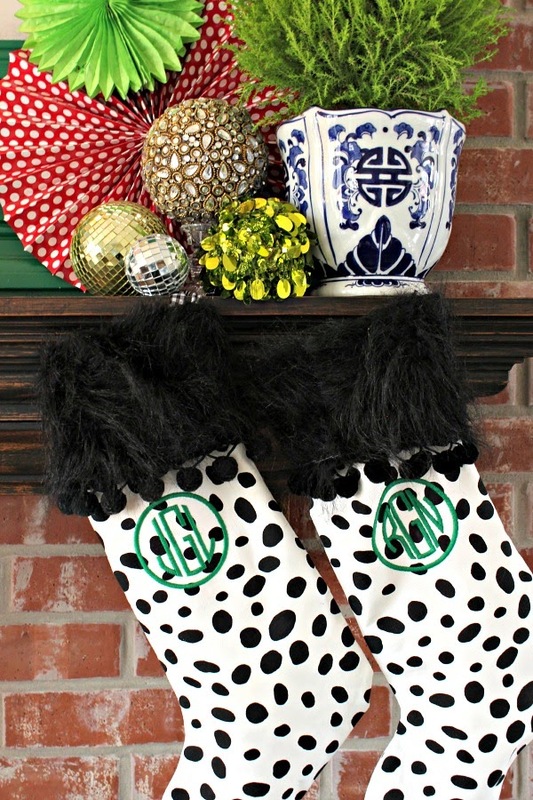 you always have the most amazing mantels! I LOVE this!! 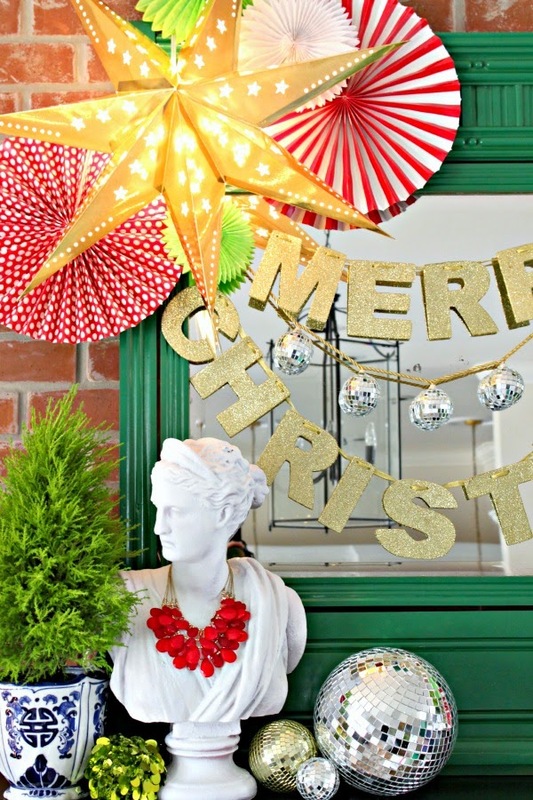 It's so bright and fun, what a beautiful vignette! Thank you Marty, I had a great time putting it together! Thanks Darrielle! Can't go wrong with classic red and green! Thanks Marigene! I was part of a dresser that we bought at a yard sale for my daughter, but we never used it for the dresser. It's been fun to have on hand to decorate with! Thanks Vel, it's fun to look back at all of the different ones! Thank you Krystine! It makes me happy every time I see it. Thanks girl! I'm ready to be d.o.n.e.! OMG this is so fun and gorgeous! 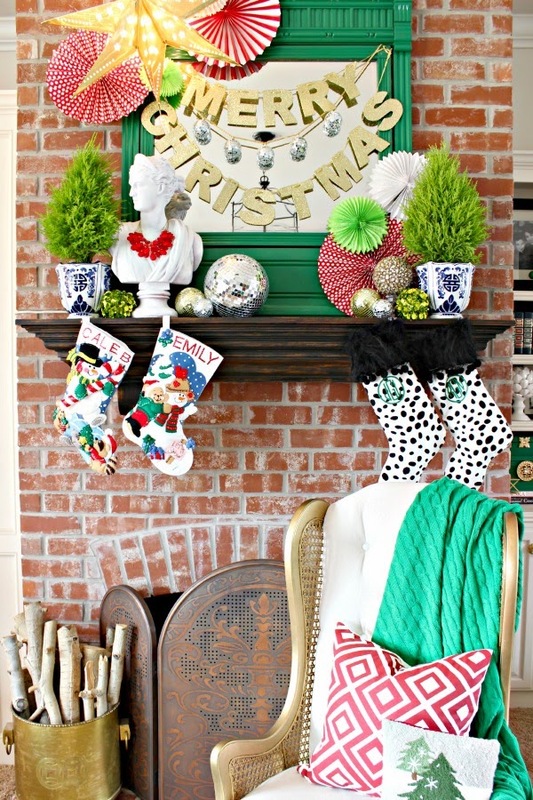 My favorite mantel this season Jennifer!! So fun, love your stockings the best!!! I saw a picture of your mantle this morning on my routine, "Slowly wake up for the day while looking at Instagram". It just instantly made me smile! So stylish & fun! Pretty....pretty! Love the stockings and the lighted star!